What Does A Steel Building Cost per Square Foot? While this is not an exact calculation – the cost varies with the complexity of the design, structural loads, finishing options, and of course size – you’re going to find that the price is relatively constant and not particularly difficult to calculate but you need a professional to help you because a seemingly small miscalculation of a few bucks in the beginning can quickly escalate by the time you’re done. This is where a Steel Building Expert helps. The first thing you should know is that the price of raw steel fluctuates – but, like gas, those fluctuations are almost always increases. Steel is priced according to market variables such as supply, demand, shipping, and grade (or quality) of the steel. Because of this, you absolutely must lock in the price of your steel building right away, even if you’re a year away from wanting to build. 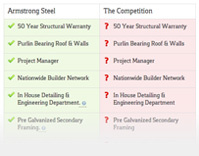 Your Armstrong Steel building is high grade yet Minimal Yield Strength. This doesn’t mean you are purchasing inferior materials. Minimal Yield Strength is the standard when purchasing structural steel – it is just means you aren’t going to have to pay high dollar for the high density steel used in the construction of railroad ties, for instance. The size of your building is also one of the most important cost variables for a steel buildings cost per square foot. For the most part, the larger the building, the lower the cost per square foot of the steel building. Because of the large clear span widths possible with steel buildings the components necessary to assemble a 40 foot wide building are the same as the components you would need for a 100 foot wide building. In other words, you’re going to need purlin clips on both sizes and because spans can be extended easily by using steel, those clips will function the same, regardless. When choosing a 40x60 or a 40x300, the rigid frames on both size steel buildings are pretty much identical, so all you’re paying for is extending the length – which doesn’t typically affect the steel building cost per square foot. Also – consider your location! Are you going to need a foundation? Are you planning on insulating your steel building? Do you plan to have drywall and an exterior finish? Those options require that the structure be engineered to support the additional weight – or loads - as it’s called in the industry. Armstrong Steel is not your ‘cheapest’ option. That’s just honest. But there are reasons we aren’t the ‘cheapest.’ Some steel building companies design buildings with the least possible and allowable standards. Manufacturing these mass-produced and ‘cheap’ or ‘light’ steel buildings often leads to costly on-site delays or misaligned holes and incorrectly sized component pieces. By the time these ‘cheap’ buildings are corrected, they end up costing you more money and time than had the steel building just been crafted correctly the first time. Additionally, Armstrong Steel uses higher quality paint – which explains our generous warranty – it’s a business decision. Armstrong Steel buildings are pre-galvanized so they last longer. And you should know, Armstrong Steel’s clips are pre-welded at the factory which prevents you from having to do additional field work. The good news is that because Armstrong Steel delivers a considerable number of buildings every week, our volume, coupled with our extensive shipping network, allows us to deliver a higher quality building for less than you think. Often times we’re more affordable than other suppliers with lower quality components. Erection of your steel building also comes with a cost. Contractors and finishers will cost money, no one works for free – except you. With some rudimentary construction knowledge and a desire to learn, you are going to shave additional dollars off your total cost by doing the majority of the work on your own. In the paragraph above, we were honest when we said we weren’t the ‘cheapest,’ so consider the next statement equally as honest – it is likely you CAN erect your steel building on your own - or at least the majority of it. But if you run into snags, have questions or issues, the project manager and detailer who worked with you in the beginning of this process are still at your disposal. We expect – in fact, we encourage – our new customers to call us from the field during the steel building erection process. The Armstrong team is prepared to offer tips and help you with questions. Do it yourself construction – you’re looking at a brand new garage for less than $25-$30 per square feet – requiring little long term maintenance – which can be purchased and delivered in a couple months – and erected in several days. Compare that to a traditional build with an Architect and a contractor crew which is going to cost you in the neighborhood of $120-$250 per square foot. But in the spirit of true transparency, we want you to know there are other costs which you have to consider, costs which Armstrong does not control, but costs which you will have whether you choose steel or wood frame/brick and mortar buildings. Utilities, power, permits, and taxes will need to be factored in to your budget as well. So the question Armstrong asks is why wouldn’t you choose steel? It’s versatile, it’s convenient to erect, it maintains its ‘shine’ well into the future, it requires little maintenance, it can be assembled in days or weeks rather than months - and it’s less than half the cost of traditionally built buildings.